A Kuwaiti man being held at Guantanamo Bay has told the BBC in a rare interview that the force-feeding of hunger strikers amounts to torture. Fawzi al-Odah said hunger strikers were strapped to a chair and force-fed through a tube three times a day. 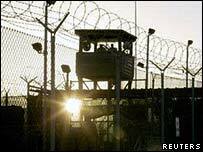 A senior US official denied the use of torture in Guantanamo Bay. Mr Odah's comments, relayed by his lawyer in answer to BBC questions, came as another inmate launched a legal challenge to the force-feeding policy. The case is being brought on behalf of Mohammed Bawazir, a Yemeni who has also been held there since 2002. The action is the first test for a new law explicitly outlawing torture of terrorism suspects, which President George W Bush signed in December. The BBC Today programme's Jon Manel submitted questions for Mr Odah to his lawyer, Tom Wilner, who has access to the camp. There was no opportunity for the BBC to challenge Mr Odah's responses. Mr Odah, who has been held at the base since 2002, was one of 84 inmates at Guantanamo who went on hunger strike in December. Just four are still refusing food. Speaking to the BBC, US state department official Colleen Graffey said all detainees were afforded regular status reviews and offered the opportunity to renounce violence. Through his lawyer, Mr Odah described his treatment during his hunger strike. "First they took my comfort items away from me. You know, my blanket, my towel, my long pants, then my shoes. I was put in isolation for 10 days. "They came in and read out an order. It said if you refuse to eat, we will put you on the chair [for force feeding]." He told how detainees were given "formulas" to force them to empty their bowels and were strapped to a metal chair three times a day, where a tube was inserted to administer food. "One guy, a Saudi, told me that he had once been tortured in Saudi Arabia and that this metal chair treatment was worse than any torture he had ever endured or could imagine," Mr Odah said. Mr Odah told the BBC that he felt like an old man despite being only 29. He described a regime where young military guards routinely beat detainees who caused problems. "If anything bad happens to the United States anywhere in the world, they immediately react to us and treat us badly, like animals," he said. "I'm always tired. I have pain in my kidneys. I have trouble breathing. I have pain in my heart and am short of breath. I have trouble urinating and having bowel movements. "Death in this situation is better than being alive and staying here without hope," Mr Odah added. The US has said it is holding Mr Odah because he is a dangerous "enemy combatant", who travelled through Afghanistan with the Taleban, fired AK-47 rifles while at an al-Qaeda training camp and fought against US and coalition forces. He dismissed the general allegations, branding them as "rubbish" and "absolutely untrue". However, he refused to elaborate, insisting he would only discuss the accusations against at a court hearing. In Washington, lawyers for Mohammed Bawazir, who has now ended his hunger strike, said the force-feeding inflicted "unbearable pain" on detainees. The BBC's Justin Webb, in Washington, says the legal challenge may be a shot in the dark. Under the terms of the new law it is not even clear whether courts have the right to hear this case, he adds. 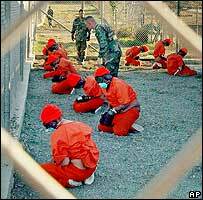 The lawyers are arguing that the new anti-torture rules which Mr Bush signed in December outlaw this practice. The UN Human Rights Commission said recently that it regarded force-feeding at Guantanamo as a form of torture, a charge the US firmly has repeatedly denied.